he Women’s Ministry is an integral part of the life of Eastminster. Our prayer is that any woman who walks through our church doors will feel a sense of belonging and a part of our growing church family. The Word gives us the importance of walking in community with one another. We encourage the women of our congregation to get involved in a small group, and connect with other women and deepen their relationship with Christ. For more information, contact the Women’s Ministry Coordinator, Kim Brammer. We always love having new folks join us! Contact Leigh Sain for more information. Join us each Wednesday to gain a new appreciation for and understanding of the Psalms: their themes, poetic structure and lyrical beauty. We begin our new video series called “Learning to Love the Psalms” by Ligonier Ministries’ Dr. Robert Godfrey. Lessons are followed by a group discussion and prayer. See our full list of Women’s activities here! 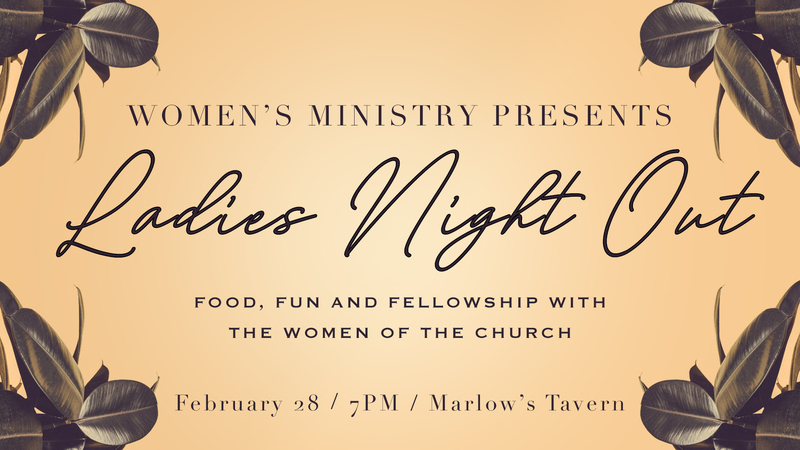 Women of Eastminster, we invite you to participate in great food, fun and fellowship! Join us at 7PM on February 28. We’re gathering at Marlow’s Tavern, 2960 Shallowford Rd, Marietta 30066. Hope to see you all there!